The item is not normally stocked due to minimum order requirements, random availability, or lack of customer demand. However, we would be pleased to order any Special Order item for you. We will notify you of the expected shipping date via e-mail after your order is processed. Should the shipping date not meet with your requirements, you may cancel order at your discretion. regular shipping Regular shipping rates apply to products with this icon. This means that the product fits into a normal shipping box and is within the dimensional and weight guidelines set out by Canada Post. 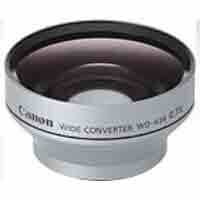 Get closer to the subject and get more in the shot with the 0.7x wide angle converter.